I have finished my Canvas quilt, after testing the pattern for Leanne of She Can Quilt. I had so much fun quilting this one. I started with the flower in the yellow center square and some stippling to make the flower petals really stand out. Some of the flower petals are a little wonky, especially that one on the top right, but I'm okay with that. Real flowers sometimes have wonky petals, too, right? 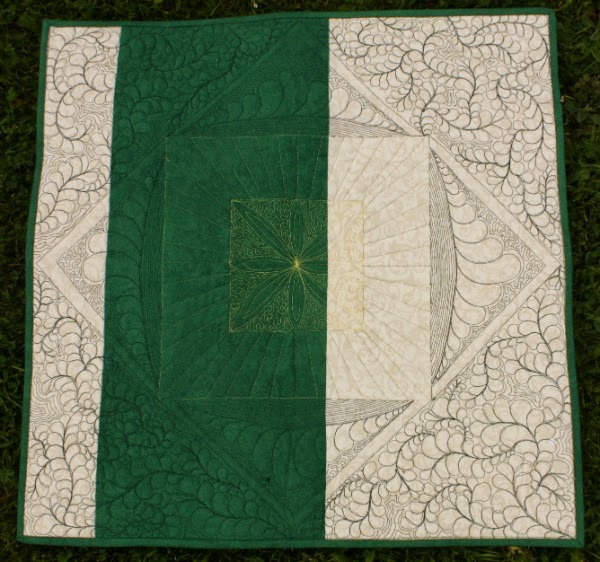 I used my Fine Line Quilter's Rulers, by Accents in Design, to quilt straight lines radiating out from the center in the light green section. I know I could have done the same thing with my walking foot, but I prefer to work with my fmq foot and not have to turn the quilt each time I want to change direction. In the large, dark green section I really had fun! First, I used the quilter's rulers to create an on-point square. I've always loved Judi Madsen's quilting and she often creates frames around patchwork pieces with her quilting. I need perfectly straight lines for this sort of thing, which is the biggest reason I bought the rulers. My lines are not perfect this time around, but that is entirely my fault and not a problem with the rulers. Actually, I love the rulers. They grip the fabric beautifully and they're easy to use. I found my problem was that as I quilted these longer lines the ruler would start to tip off the edge of the machine bed, since I don't have an extension table for my sewing machine. An extension table is now even higher on my list of quilting 'wants'. I started out with only the barest notion of what I wanted to do inside the frame, so I was really making it up as I went along. I knew I wanted to do feathers, but it wasn't until I had the frame quilted that I decided to create the arc and have the feather only on one side. Then I had to decide what to put under the arc. I went with lines following the arc, done very close together, even crossing each other at times. The overall effect with the feathers reminds me of a tiara. It makes me think of the Big Bang Theory episode where Sheldon gives Amy a tiara. Have you seen that one? That left me with the outer corners. At first I thought about echoing the flower shape from the middle section, but I decided to go with a feather fill design. I think it's a Leah Day design, but I can't remember for sure as it was a long time ago that I came across it. I really love the stronger lines created by the feather spines. My feathers still aren't perfect, which really shows up on the back, but I think they got better as I worked my way through the four corners. For the back, I had almost enough of this cream tone-on-tone, so I spliced in a stripe of the green from the front to make it fit. I love, love, love how the quilting looks on the back! It has me seriously considering making a wholecloth quilt. I've always admired them, but would never even think about tackling it back when I hand quilted everything. It would just have taken too long to be in the realm of possibility. Now that I'm machine quilting, though, it's seeming a little more doable. Though it's impossible to tell in the picture, the thread I used for the dark green section is different from the yellow and the light green. The dark green is the Gutermann 100% polyester I've used for most of my quilts. I really like it, but I was interested in trying the Connecting Threads 100% polyester cones. The Connecting Threads cones are much, much cheaper than what I pay for the Gutermann, plus I've read excellent reviews for it. Not such great reviews for their cotton thread, but the polyester seemed good. So, when a lady here in town had some cones to sell I nabbed 10 of them. There was a yellow that matched my fabrics in this quilt perfectly and a light green that would work, so I tried those out. My Dad made me a thread cone adapter for my machine modeled after the one that Erin of Sew at Home Mummy posted about. The adapter worked perfectly and so far I'm pleased with the thread. There is almost no lint, just as with the Gutermann thread, and I like that it's a finer thread (a 70 weight rather than a 50). I'll know more after I've used it for more, and larger, projects, but as of now I would recommend it. Leanne has kindly offered me a copy of the Canvas pattern to give away to one of my readers. So, if you'd like to make your own version of this beautiful pattern, leave me a comment on this post. Since I tried two new things with this quilt (the rulers and the thread), in your comment tell me something new you've tried recently. It doesn't have to be quilting related - anything at all that was new for you qualifies, whether it's a new recipe, a new vacation spot, a new quilting gadget or whatever. Interested in knowing what else I've done that was new recently? Check out this post to see how my husband and I marked our 15th anniversary. It's completely G-rated, I promise! I'll keep the giveaway open until Tuesday, August 12th, when I'll use random.org to draw a winner. I'm looking forward to reading about all the new things you've been doing lately. and Can I Get a Whoop Whoop? I am impressed with your quilting using that sewing machine. I need to get into some serious free motion practicing. Still busy cross hatching with my walking foot on GORF. The new thing I am trying right now is a supplement called SierraSil for my osteoarthritis. The lady who was helping me with the long arm rental last month had great results. I have been taking the powder in water (tastes awful) first thing in the morning and then waiting a hour before having breakfast. I decided to change nothing else in my routine to make sure any results were from the SierraSil. I have not noticed any significant improvement or less stiffness and pain, but, my husband thought I was walking easier when we went out today to open gates and move some cows. I will take it until the container is empty and reevaluate. I am so impressed with your straight FMQ lines! They look great, I am going to have to look into those rulers. For something new, I just finished quilting the largest quilt I have ever made. Thanks for the chance to win. Your quilt turned out beautifully!! I have the Accent Design Rulers too and it does take some practice to keep everything in place - LOVE them! My new thing - a whole cloth quilt!! It is a family tree quilt, I am making it up (the tree not the family LOL) as I go. I highly recommend trying one! Wow that came out great! Love the greens and yellows. This is beautiful! Your quilting is stunning. your quilting is amazing as always :-) Something new - I made my first ever pencil case! I just found your blog; I came over from Sew Fresh Quilts. Your quilting has really taken this quilt up a notch. I recently tried quilting with a polyester thread. I had been taught that one must quilt with cotton... I'm liking the poly. What an incredible piece, Leanne! Wow! You did an awesome job. How fun that you two Canadians are both named Leanne. The latest new thing I have done is some wavy line organic quilting, but I was using my walking foot. I think I'm allergic to feathers Leanne, yours look perfect! 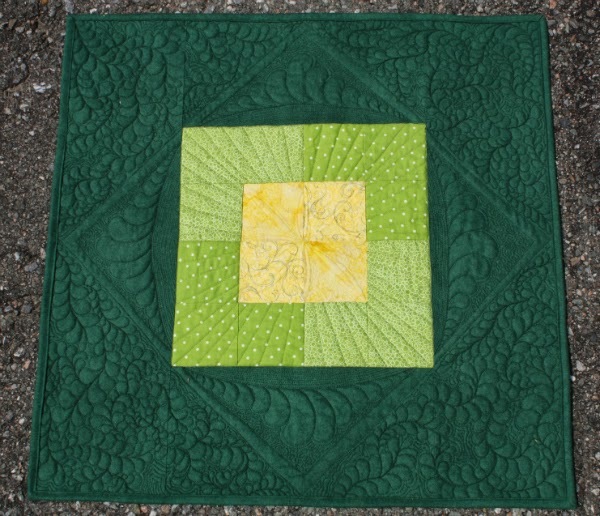 Just came here from Needle and Thread Thursday - your quilting is great. I don't FMQ but I love how it looks. gorgeous! 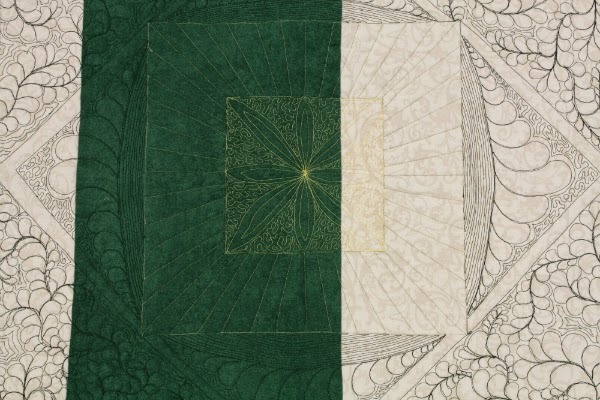 This quilting is amazing. 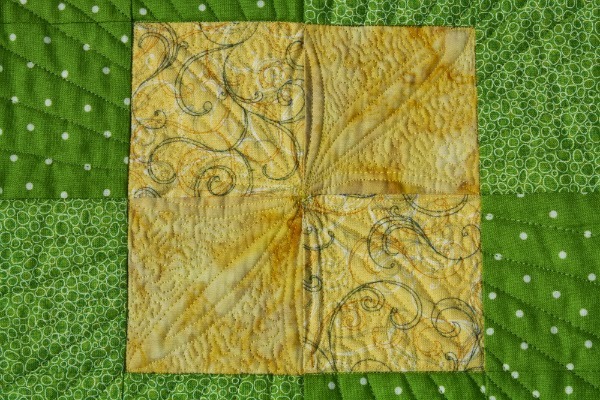 Wow, Leanne, I love how you made the pattern your own with the quilting. Fabulous job! So glad you linked up to TGIFF! 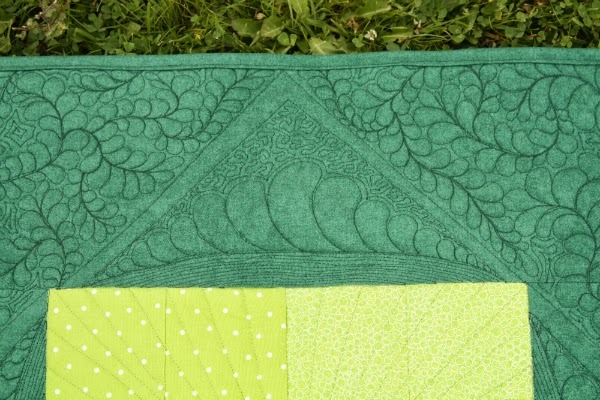 This quilting is just gorgeous. Exquisite Leanne! I just machine stitched some binding for the first time and it looks pretty darn good!! What a lovely version of Canvas! 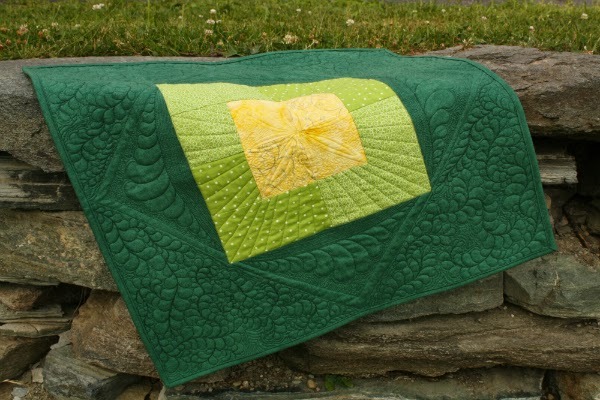 Your quilting just is so delightful - just amazing! What a great quilt - I love the quilting! Recently I've been ill so I tried out daytime TV - it's mostly dreadful !!! Very nice! It came out wonderfully. Looks like lots of time and patience went into that one. Your machine quilting is exquisite. What I've tried lately is hand quilting....it is slow but I love it. Trying a full machine quilt for the first time. I'm pretty good at cutting pieces and doing assembly buy only did tied checker quilts before. Thanks for the inspiration this is gorgeous! 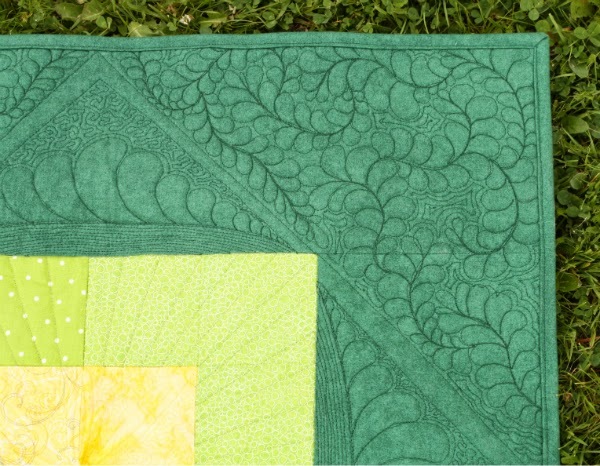 This quilt pattern is lovely, lucky you for getting to try it. Seeing your FMQ, which I think is lovely, reminded me that I have just returned home after attending a workshop at the Festival of Quilts in Birmingham, this was the first time I have attended the festival, great show. The workshop was 3hrs run by Kimmy Brunner on FMQ feathers using the Handi Quilter Sweet 16 sit down long arm, something I have never used before. Despite Kimmy's best efforts my feathers were pitiful. I know how hard they are to get right so well done to you. wow your quilting is fantastic ! I'd love to give Leanne's pattern a try too - I tried some feather quilting on a little pillow cover last week and I was quite happy with my first attempt ! Amazing quilting! I tried a new straight line quilting pattern, still scared of my free motion foot! It's fun to see your quilt and how you've quilted it--superior work btw! Yes, I remember that tiara and your quilting does resemble that. I'm working on a 60" quilt in some very bright colors and that same pattern. I love that pattern! (My quilting is pretty mundane compared to yours.) I got the thread in the mail yesterday for my finish. It is surely fun to see this pattern in different color combinations! Great finish. I just bought a new souped-up sewing machine. I started quilting seriously this year and I needed an upgrade. 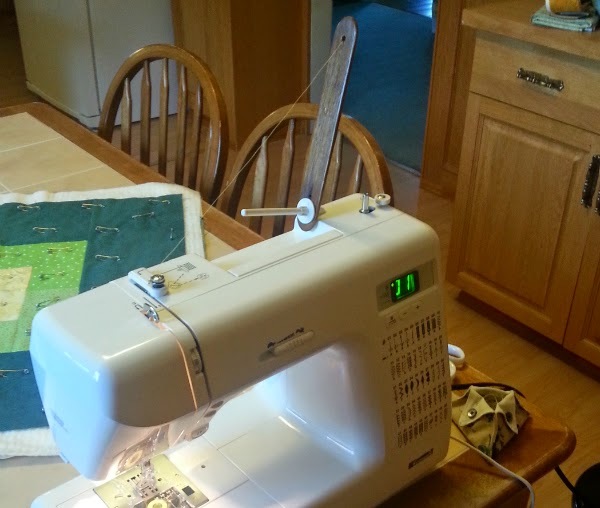 This sewing machine makes everything easier -- I love it! The quilting on this is fantastic! I love that you can do those designs on a domestic machine and can't wait to do more detailed projects myself. I just finished my first FMQ project and am so pleased with it. And yes, LOVE The Big Bang Theory! !